The dsp.ArrayPlot System object™ displays vectors or arrays where the data is uniformly spaced along the x-axis. Create the dsp.ArrayPlot object and set its properties. scope = dsp.ArrayPlot creates an Array Plot System object, scope. Specify whether to use the SampleIncrement and XOffset property values to determine spacing, or specify your own custom spacing. If you specify 'Custom', you also must specify the CustomXData property values. Open the Configuration Properties. On the Main tab, set X-data mode. Specify the desired x-data values as a row or column vector of length equal to the frame length of the inputs. If you use the default (empty vector) value, the x-data is uniformly spaced and set to (0:L–1), where L is the frame length. Open the Configuration Properties. On the Main tab, set Custom X-Data. To use this property, set XDataMode to 'Custom'. Specify the spacing between samples along the x-axis as a finite numeric scalar. The input signal is only y-axis data. x-axis data is set automatically based on the XOffset and SampleIncrement properties. For example, when Xoffset is 0 and SampleIncrement is 1, the x-data for the input signal is set to 0, 1, 2, 3, 4, etc. If you set SampleIncrement to 0.25, the x-axis data becomes 0, 0.25, 0.5, 0.75, 1, etc. Open the Configuration Properties. On the Main tab, set Sample increment. Open the Configuration Properties. On the Main tab, set X-offset. Specify whether the scale of the x-axis is 'Linear' or 'Log'. If XOffset is a negative value, you cannot set this property to 'Log'. Open the Configuration Properties. On the Main tab, set X-axis scale. Specify whether the scale of the y-axis is 'Linear' or 'Log'. Open the Configuration Properties. On the Main tab, set Y-axis scale. 'Stem' – The scope displays the input signal as circles with vertical lines extending down to the x-axis at each of the sampled values. This option is similar to the stem function. 'Line' – The scope displays the input signal as lines connecting each of the sampled values. This option is similar to the line or plot functions. 'Stairs' – The scope displays the input signal as a stair-step graph. A stair-step graph is made up of only horizontal lines and vertical lines. Each horizontal line represents the signal value for a discrete sample period and is connected to two vertical lines. Each vertical line represents a change in values occurring at a sample. This option is similar to the stairs function. Stair-step graphs are useful for drawing time history graphs of digitally sampled data. Open the Style dialog box and set Plot type. Specify the name of the scope. This name appears as the title of the scope's figure window. To specify a title of a scope plot, use the Title property. Specify, in pixels, the size and location of the scope window as a four-element vector of the form [left bottom width height]. By default, the scope window appears in the center of your screen with a width of 800 pixels and height of 450 pixels. The default values for this property may change depending on your screen resolution. Specify the text for the scope to display below the x-axis. Open the Configuration Properties. On the Display tab, set X-label. scope(signal) displays the signal in the Array Plot. 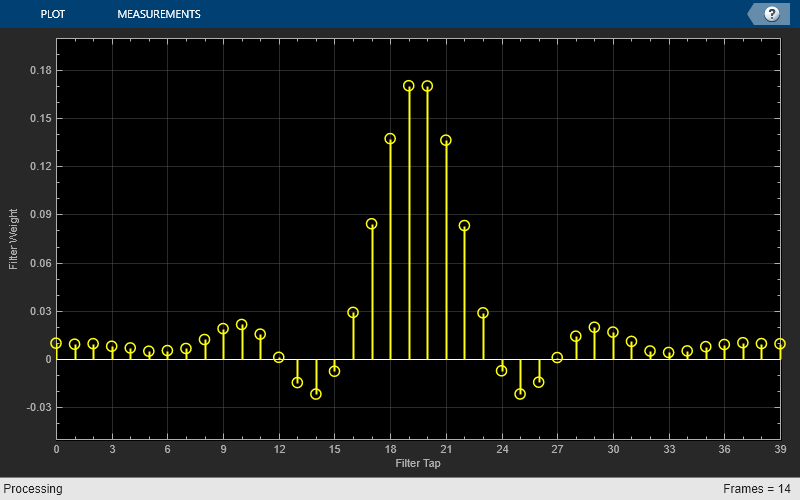 scope(signal1,signal2,...,signalN) displays multiple signals in the Array Plot. The signals must have the same frame length, but can vary in number of channels. You must set the NumInputPorts property to enable multiple input signals. Specify one or more input signals to visualize in the dsp.ArrayPlot. Signals can have a different number of channels, but they must have the same frame length. Note: This example runs only in R2016b or later. If you are using an earlier release, replace each call to the object with the equivalent step syntax. For example, myObject(x) becomes step(myObject,x). Create a new Array Plot object. 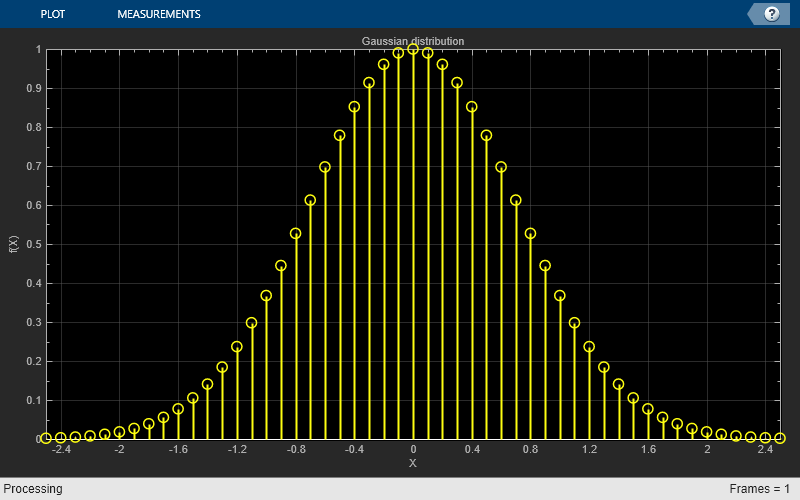 Configure the properties of the Array Plot object for a Gaussian distribution. Call the Array Plot object to plot a Gaussian distribution. View least mean squares (LMS) adaptive filter weights on the Array Plot figure. Watch the filter weights change as they adapt to filter a noisy input signal. Create an LMS adaptive filter System object. Create and configure a dsp.AudiFileReader System object to read the input signal from the specified audio file. Create and configure a dsp.FIRFilter System object to filter random white noise, creating colored noise. Create and configure an Array Plot System object to display the adaptive filter weights. 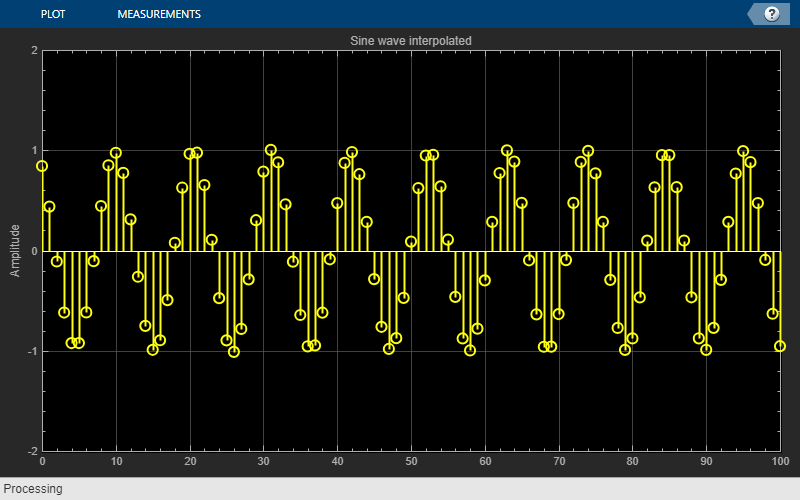 Plot the LMS filter weights as they adapt to a desired signal. Read from the audio file, produce random data, and filter the random data. Update the filter weights and plot the filter weights. To close the Array Plot window and clear its associated data, use the MATLAB® clear function. To hide or show the Array Plot window, use the hide and show functions. Use the mcc function to compile code containing an Array Plot.